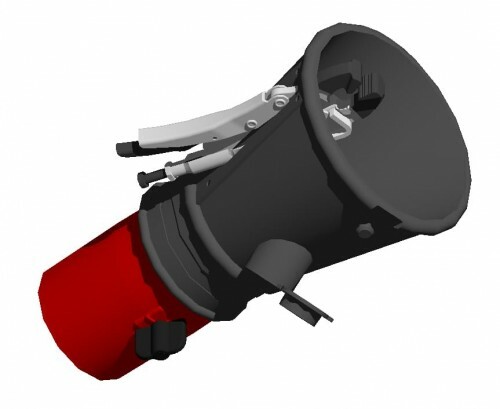 Conical rubber nozzle for extracting exhaust fumes with 160 mm extraction opening and a hose-connecting cowling measuring 75, 100 or 125 mm in diameter. This model has a fixing gripper with vulcanized ends in order not to scratch the exhaust pipes of the cars. The version for a hose measuring 100 mm in diameter is equipped with a hermetically sealed manual closing valve and a grille to intercept extracted foreign bodies.